Bartender Bob Saginowski finds himself at the center of a robbery gone awry and entwined in an investigation that digs deep into his Brooklyn neighborhood's past where friends, families, and foes all work together to make a living - no matter the cost. 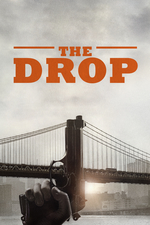 Based on the short story Animal Rescue by Dennis Lehane, The Drop is dedicated to its star, the late James Gandolfini. Originally set in Boston (the story featured in an anthology called Boston Noir), the filmmakers moved the location to Brooklyn. It's Belgian director Michaël R. Roskam's first English-language film, and apart from Gandolfini all the leading actors are European - Tom Hardy, Noomi Rapace, and Matthias Schoenaerts. The neo-noir movie, which just missed out on Edgar Wright's Top Ten of 2014 list, does a great PR job on pitbulls. Meet Rocco the puppy (short clip on the official fb page). Tom Hardy defends the breed "Did you know that the Pit bull’s the highest decorated military dog? It’s true, because of their loyalty, and its sensitivity." Tom Hardy demonstrates how to hug a puppy. I wrote about this film for my collection of reviews of Irish-American gangster films, which this, very subtly, is. I liked it very much. That's a really interesting collection of reviews, maxsparber - thank you. I'm always here for gangster films (and Vito Russo shout-outs). This is an Irish mob movie set in a time when the Irish mob is gone, and all hints of it have been erased. This never occurred to me, but it's another emptiness in a story that's full of them - Bob trying to erase his self, Marv's father on life support but not alive, the Cathedral that's soon to be condos.